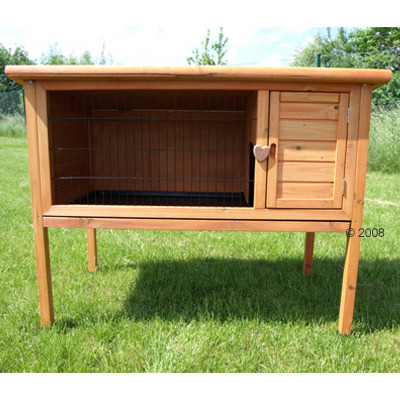 The Rabbit Hutch Outback Classic is just as the name suggests - a classic home for rabbits and small pets. The quality built wooden hutch is divided into a smaller fully enclosed sleeping area and a more open living space with mesh wire front. These two areas are connected by a small passageway opening in the dividing wall. The wooden door on the front of the bedroom allows easy access for cleaning and reaching your pet and the fold-open roof ensures that all areas of the hutch are easy to reach from above. A drawer with plastic basin across the entire width of the cage allows for easy cleaning. The hutch is also completely weatherproof due to the treated wood and roof construction with tar paper. The four feet of the hutch are covered with plastic to protect them from moisture.